This plant is, as a whole, so delicately tinted and so decorative in form, that it is most attractive, particularly against the sandy soil where it grows, deserving the Greek name more than some of its slightly awkward sisters. It is about fourteen inches tall, with a stoutish, rather straggling, prostrate stem, which is pale, pinkish, sticky and fuzzy. The leaves have long leaf-stalks and are pale bluish-green, leathery and smooth, but fuzzy on the mid-vein of the under side, and the flowers are numerous, rather small, in handsome roundish clusters, which are about two inches across, with a papery, pinkish or yellowish involucre, of about five, separate, rounded bracts. 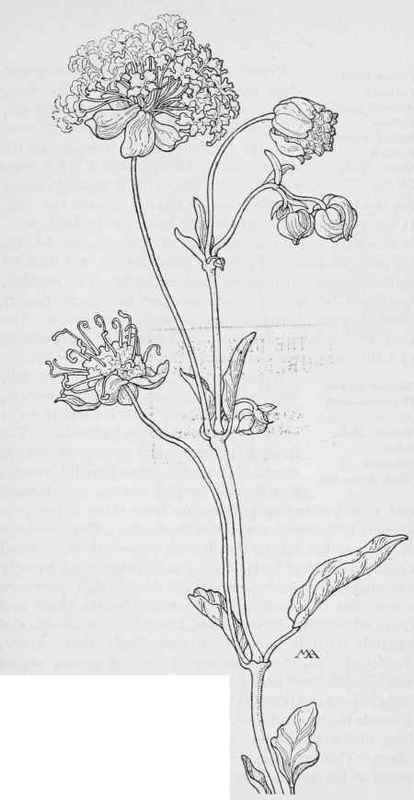 The calyx is corolla-like and salver-form, with a long, yellowish or greenish tube and five lobes, prettily crinkled at the edges. The seed-vessel is very curious, resembling a round, yellowish sponge, with hooks sticking out of it, and the flowers are deliciously sweet-scented. This is sometimes called Snowball. Sand Puffs-Abronia salsa. FOUR=O'CLOCK FAMILY. Nyctaginaceae.